Vizlib Filter is a highly customisable, supported and easy-to-use filter component for Qlik Sense to make selections in the data model. It supports different views as Listbox, Buttongroup and Dropdown and provides you with a lot of features as custom styling options, interactivity options, one-selected-value, default-values and many more. Vizlib Filter is a control component extension and helps you handle and present date fields in a much more user-friendly way, allowing you to build intuitive and compelling dashboards for your users. Export Field values to XLS and copy cell value on right-click. Powerful and user-friendly search functionality which 100% leverages the Qlik Engine API. Conditional show&hide of filter values. Open Qlik Sense and add the 'Vizlib Filter' extension to a sheet. This is where you can choose and pick your filter field, be it a single dimension, a drilldown or a master item dimension. You can add the Frequency Count to the field value. In there you can pick and choose from relative/absolute/percentage frequency representation. By default, the field is sorted by its selection state, but in here, you can modify the setting. You can choose sorting by six different ways, including a combination of all six of them. It's important to note the defined order of sort properties is fixed by Qlik. If the Listbox is chosen as the filter type, there are several of interesting options you can choose from before you proceed with the detailed styling options. Naturally, Listboxes are very long objects, but instead of always having a vertical scrollbar, you might want to make the filter responsive to the user's screen size. This means, that once the object is very small, it automatically transforms into a dropdown. In such a case, all dropdown settings are inherited. Here you can change the styling of your listbox values with options such as None, LED, Tick and Checkbox. The Dropdown settings are very similar to the Listbox settings with some minimal differences. Here you can change the styling of your Dropdown values with options such as None, LED, Tick and Checkbox. The Buttongroup is the third display type of the Vizlib Filter and allows you to visualize selectable dimension values in button format. Next, to different styling options, you can also define the positioning and size of the button(group). Here you can choose how the filtering is done in the Vizlib Filter. You can enable Multiselect, Drag Select or make the whole object read-only, preventing the user from making selections. Here you can Show/Hide Alternatives, Excluded values and define a set of default values. When the field has no selections, either because it was manually cleared or because it the app just opened, default selections will apply. 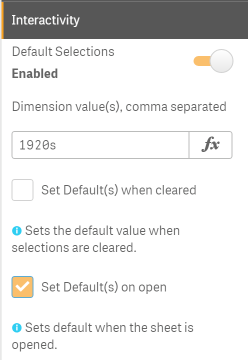 Multiple default selections need to be comma separated (no space). Only One Selected Value permits the user to select a maximum of one value at a time. Keep searchbox at the top when scrolling in dropdown mode. When in single select the dropdown label was blinking after a selection displaying the previous value. When in listbox mode the transparent background was getting lost after changing and coming back to the sheet. Big performance improve for dimensions with a lot of data values - added virtualisation on the filter. Fixed size to data dropdown mode for led style. Added show/hide data handling for the whole filter. Improved the dropdown height with an auto size to data. Show/Hide snapshot option in interactivity was not working. Fixed search box now working on firefox. Fixed some rendering issues with QS April'18. New interactivity option, 'Set Default(s) on open'. Where default selections are applied on sheet open event. When in Dropdown mode and one selected value is activated, close the dropdown after selection. Input text was still visible & focused after dropdown was collapsed. Scrollbar returning to the top after selections. In IE, when you finish scrolling it would end with a selection. This has been suppressed. Right-side border was not visible in Chrome sometimes. Fixed an issue where the General Options property panel was sometimes hiding. Fixed several tiny CSS bug fixes for Qlik Sense Desktop and for Qlik Sense Focus Theme. DefaultValues was not properly supporting Variables.